These strawberry salad recipes are not only well-tasting, but they are also good for your health. When thinking about strawberry salad you might only think about the "conventional" fruit salad. But there are many more varieties that you can make. I personally love best the sweet ones with fruits. But the salty ones with with chicken, spinach or pretzel can make a complete meal. Even though these recipes might sound a bit weird, I assure you they taste exquisite! The natural sweet and fruity flavor of fresh strawberries makes each of the recipes below a real enjoyment. Some of my favorites include almonds, chicken and even spinach. When making a salad with chicken you can even use it as a main dish. We love to eat light and healthy foods especially in summer time, when you can get all kinds of fresh fruits and vegetables. Additionally, the health benefits are big: you get a boost of vitamins, calcium and fiber together with a low amount of calories. Pineapple and Coconut - Two different recipes, each with a tasty, exotic touch. Fruits and Yoghurt - this is my personal favorite. So delicious! Salty Salad Recipes - Lettuce and Pretzels. You'll love the one with pretzels. It's heavenly! Spinach Salad - three totally different recipes with Spinach and Strawberries. Vegetable Salad - vegetable lovers, this if for you. Lettuce, Avocado and more fruits make your dish into a revelation. Strawberry Chicken Salad -if you just can't do without meat. Healthy chicken will do it for you. 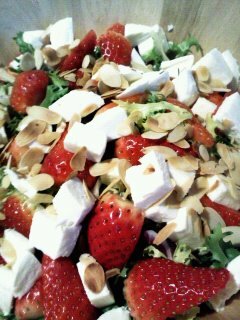 Chicken with Almonds, Strawberries and Feta Cheese -my favorite, invented by a friend who's one of the best cooks I know.